Holocaust victims who are no longer living (click here to read a story about it and here to see the fake profile) are welcome on Facebook but the founder of the JIDF - who is very much alive and trying to do good - cannot be on Facebook? On Yom Kippur it appeared to us that Facebook was going to clamp down on many profiles of Jews, conservatives, and pro-Israel advocates. In reality, they selectively and subjectively clamped down on some profiles, but not others. Fact is, according to Facebook's "TOS," one cannot have a personal profile of a business name or of a fake person. The founder of the JIDF is a REAL person who had to do things a certain way due to privacy, security, and safety concerns in which Facebook executives seemed to understand at some point, but who no longer appear to care. Does Facebook subjectively and selectively enforce its rules? We think so - why have some of the following accounts been taking down while some of them remain, despite the fact that they are ALL breaking Facebook's TOS? Of course, none of this is really "new" since Facebook's "enforcement" of its rules against hatred and terrorism is also inconsistent, filled with double standards, hypocrisy, and subjective/selective TOS "enforcement." 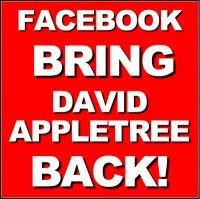 If you miss David Appletree and are sick of Facebook's games, please learn how to TAKE ACTION in the updated section here, and be sure to follow David on Twitter in the meantime. There's also a Facebook group supporting David, but we do encourage you to use Facebook less until they bring David back, proving that they actually care about the privacy, safety, security, and content of their members. Also, please read the articles below, as no one is more on top of ALL the major problems on Facebook than the JIDF.